Available in the Suffragettes offer. 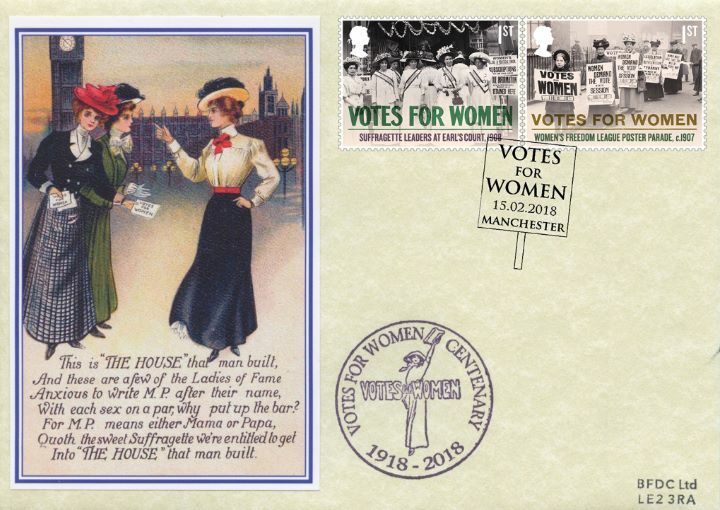 The above Royal Mail Votes for Women stamps were issued on 15 February 2018 by Royal Mail and feature the following stamp designs: 2nd Lone Suffragette Whitehall 1908; 2nd Great Pilgrimage 1913; 1st Suffragette Leaders Earl's Court 1907; 1st Poster Parade 1907; £1.40 Welsh Suffragettes 1911; £1.40 Released from Prison 1908; £1.57 Sophia Duleep Singh 1913; £1.57 Prisoners' Pageant 1911. The 'THE HOUSE that man built' first day cover with the Manchester, Banner, Special Handstamp postmark has been produced by Bradbury and features these stamps which can make a very collectible and lovely gift.